Redwood vs Cedar - Which "Wood" You Choose? When looking for a play set for your backyard there are many options. One of the most popular types of swing sets are wood play sets made from cedar wood. Cedar is a great choice for your play set. 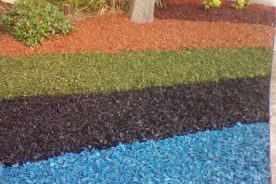 It is naturally rot, decay, and insect resistant and doesn’t require a lot of maintenance. It is very durable and will last a long time with proper maintenance. It also has a pleasant natural aroma. Because cedar is a popular building material there a lot of options for play sets. 3 What are some cedar play set options? 4 So is Cedar the Right Choice? If you have decided on wood as the material for your play set, chances are your are trying to decide on cedar or redwood. Which is better? Both woods have many advantages and it often comes down to personal preference. Both woods contain natural chemicals that help the wood resist moisture and humidity. This prevents the boards from warping or rotting and also deters insects. Cedar trees are grown in the northeast United States and Canada. Redwood trees are grown in California. Cedar is also available from international markets. Redwood has a reddish-brown color in appearance. Cedar, depending on the type of cedar used, can have a yellow, red, or white appearance in color. Both will turn a silver-gray in appearance over time if not periodically sealed or stained. A tinted stain may be used for either. Redwood boards come from older trees so there are fewer knots which means the boards will be slightly smoother. Redwood is a harder wood than cedar. It was found to be 23% harder than cedar when the Janka hardness test was used. Because it is a harder wood it will last longer and is more durable. Redwood has more natural occurring chemicals than cedar. This protects the wood so less maintenance is required over time. Cedar is more readily available domestically and internationally and grows more quickly than Redwood. As a result, Cedar is often less expensive. Both woods are taken from industries that are sustainable. Trees that are cut down are replaced. Both industries take into account the amount of time needed for seeds to grow into saplings and don’t cut down trees faster than they grow. Redwood and Cedar wood are also more environmentally-friendly than composite woods because they are all-natural products. Cedar naturally begins to look silver or gray over time. If this look is not desired, painting or staining will minimize this. To maintain one’s cedar swing set it needs to be cleaned periodically, usually annually or biannually. This will increase the life of your play set. Soap and water will remove dirt and stains from the wood. The wood can also be power washed. 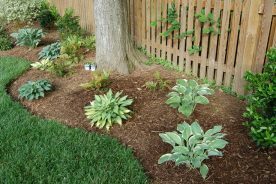 Bleach and water can be used to remove mildew that has started growing on the wood. Another option would be to use a cleaner containing oxalic acid. Oxalic acid cleans the wood and restores its natural color. To prevent graying in the future use a wood sealer that contains UV inhibitors. It is unnecessary to stain the cedar wood, however that may be one’s preference to achieve a different color. Before applying stain be sure the playset is clean. Remove accessories to prevent stain-drips. Apply stain according to manufacturer’s instructions. Allow to dry for 24 hours before using. The best time to apply stain is when the temperature is above 40 degrees Fahrenheit with low humidity. For the best results re-apply the sealer or stain annually. 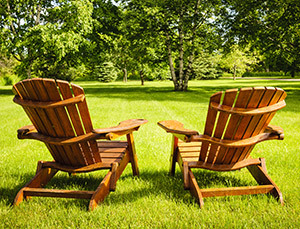 Check out our new article for more tips on maintaining your wooden swing set. 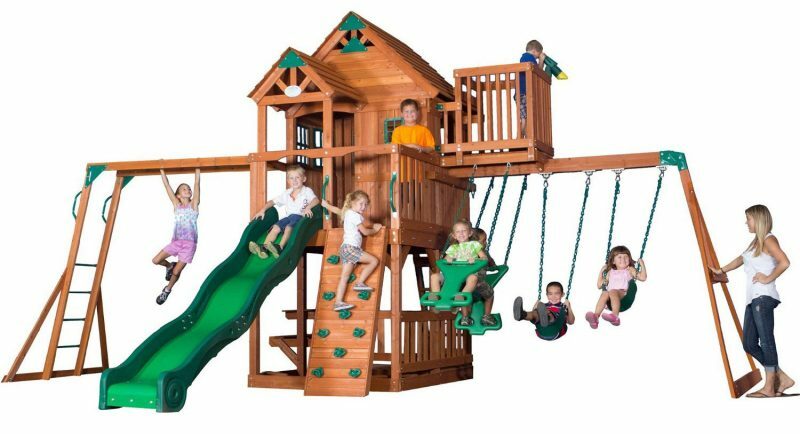 What are some cedar play set options? There are many options for cedar play sets. Here are some choices. The Summerstone play set is manufactured by Cedar Summit. 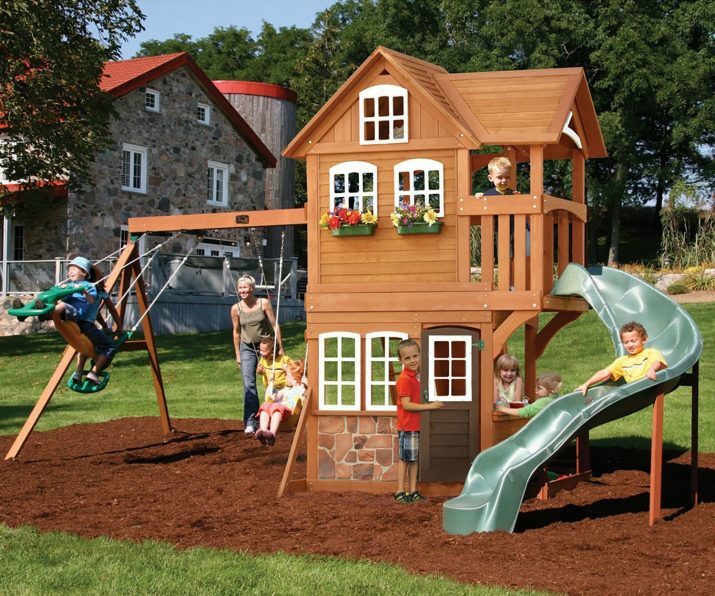 This play set has many neat features including a two-story clubhouse. The clubhouse includes three windows on the upper level and two windows on the lower level. There is also a door on the lower level. The roof of the club house is made from wood and even includes a gable. There is faux stone on the outside of the lower level. The whole club house does a great job of looking like a little house. There is also a bench and table on the lower level. It is in the shade so it’s a great spot for having a snack and relaxing. The second story of the clubhouse is accessible by either ladder or rock wall. This is great choice for kids that haven’t mastered the rock wall, or just don’t want to use it. From the second story of the clubhouse kids can use the slide. Along with the slide, clubhouse, and rock wall the play set also comes with two swings and a glider. 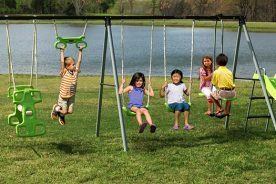 Swings are usually the most popular part of a play set so it’s great that there is more than one. The lumber for the play set comes pre-cut, pre-drilled, and pre-stained. Assembly is easy when following the directions, but may take some time. Plan for 10-15 hours for assembly. The dimensions of the play set are 18’ long by 9’ wide and 10’ high. With a little planning this playset will easily fit into a small yard. The manufacturer recommends this play set for kids ages 3-10 with a maximum of 10 kids at one time. It would be a great set for large families or for neighborhood gatherings. 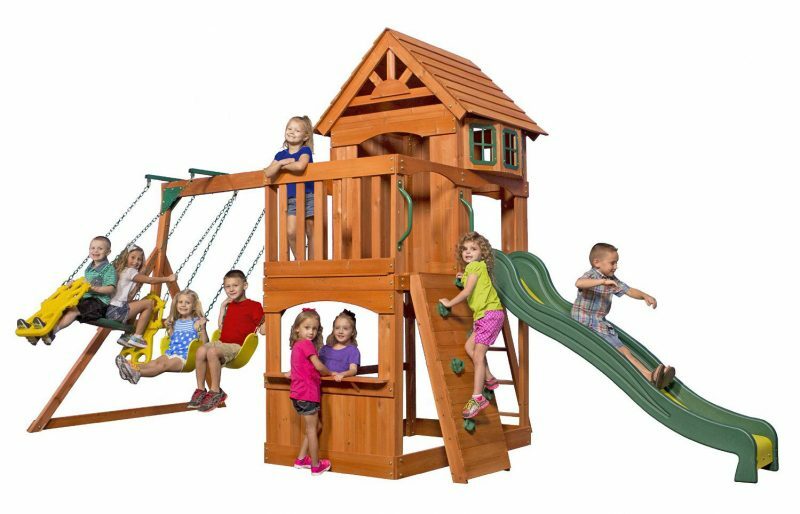 The Atlantis Play Set from Backyard Discovery has similar features to the Cedar Summit Play Set. The Atlantis features a clubhouse with bay windows, a gable, and even a porch. The clubhouse can be accessed by a ladder or a rock wall. The ladder and rock wall are on different sides of the clubhouse. This eases traffic jams that may occur when lots of children want to use the slide. The slide is accessed from the clubhouse. The lower level of the play set can be used as a sand box (sand not included). There is a window with a shelf attached to the sand box. It would be a perfect snack shelf or the kids can use it as a pretend restaurant window. There is no bench at the window. The play set includes two swings and a glider. The glider can be used by two kids. The play set measures 18’ long, 7’ wide, and 9’ high. The height of the clubhouse is 4.’ It would be perfect for a smaller back yard. All the lumber comes pre-cut, pre-drilled, and pre-stained. Plan for 10-12 hours for assembly. The manufacturer’s recommended age range is 3-10. The Skyfort is manufactured by Backyard Discovery. It has a lot of fun features. The clubhouse has wooden roof with shingles, bay windows, and gables. There is also a porch. The neatest part of the clubhouse is the crow’s nest. The crow’s nest is accessible by ladder from the clubhouse. It includes an attached telescope. The playset would make an awesome imaginary pirate ship. The lower level of the clubhouse includes a deck and table and bench. It is in the shade and would make a perfect picnic spot. There is also room for a sandbox (sand not include). The lower level is enclosed on two sides by a fence. The third side is partially enclosed by the picnic table. This would help keep sand toys in the sand box. The slide is accessible from the clubhouse. There is a ladder and a rock wall to enable admission to the clubhouse. When assembling the play set the ladder, rock wall, and slide can be placed in any of the three openings. This allows the clubhouse to be customizable. The slide comes out to the front or back of the clubhouse. The swings and other features are on the sides of the clubhouse. The placement of the features is nice as it prevents congestion and limits the possibility of kids running in front of the swings. The clubhouse is located in the middle of the playset. There are monkey bars on one side of the clubhouse and swings on the other side. There is room for two swings and a two-person glider. This swing set measure 21’ long, 16’ wide, and 12’ tall. The deck of the clubhouse is 5’ high. The recommended age group is 3-10 years. This would be a perfect play system for a larger backyard. There are so many things to do on the play set the kids will never get bored! It would be great for a larger family or at a neighborhood destination. The lumber comes pre-cut, pre-drilled, and pre-stained. Because it is a larger playset plan for 20-30 hours of assembly. So is Cedar the Right Choice? Cedar is an excellent choice as a material for a swing set or play set. It is durable, visually-appealing, and budget-friendly. With proper maintenance children will get many wonderful years of play out of a cedar swing set.